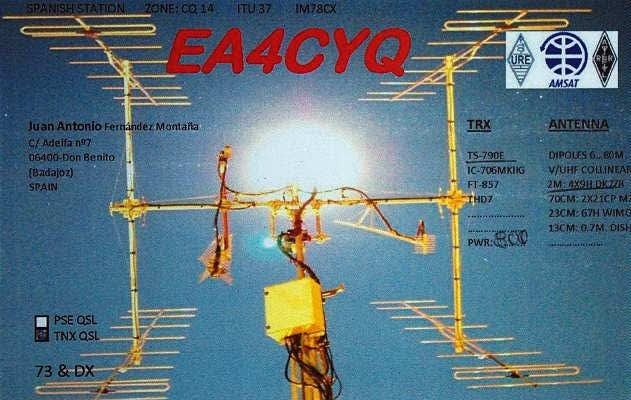 CQ - 630m Crossband Anyone? 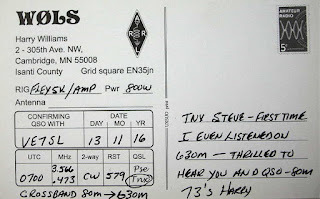 A very beautiful QSL arrived in the mail last week, confirming my 630m crossband contact with Harry, WØLS, in Minnesota. 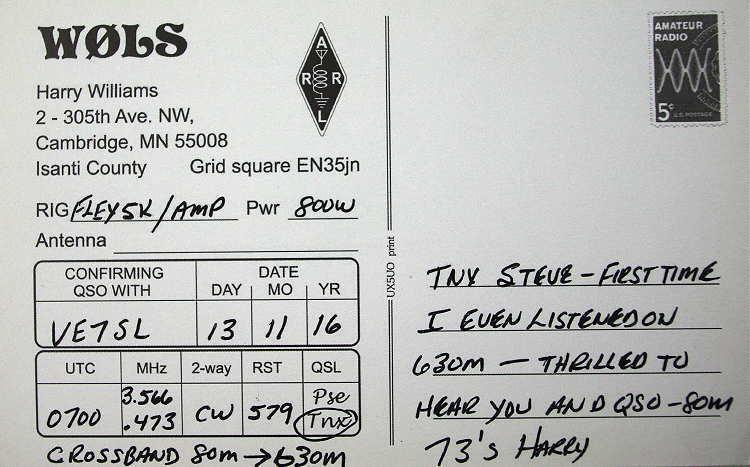 According to Harry's card, this was the first time he had ever listened on 630m and was very surprised to hear me, let alone complete the two-way contact. 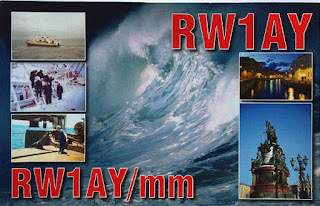 Harry was transmitting on 80m CW while I was transmitting on 630m, on 473.00 kHz. It really does not take too much to be able to hear signals on 630m, especially if you are not overwhelmed with a high noise floor ... most low band wire antennas will hear pretty well down there, when pressed into service. 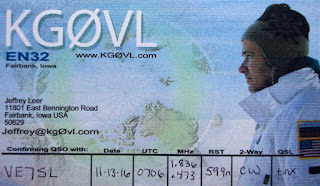 This week, the card from Jeffrey, KGØVL in Iowa arrived. 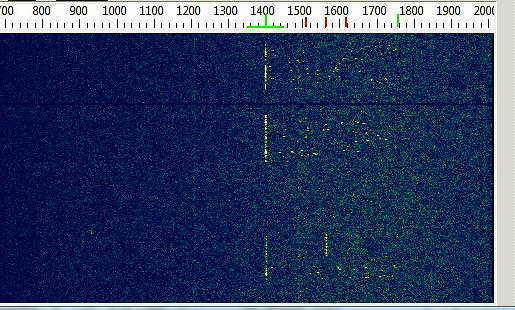 This one also confirmed a 630m crossband contact. 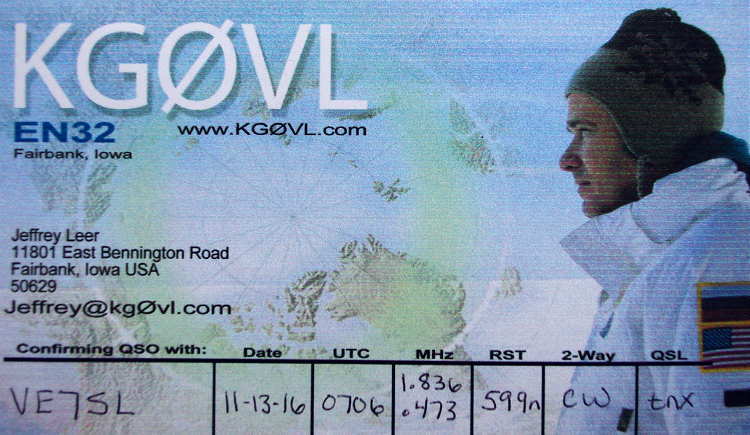 Both of these QSO's were made during the November's 630m activity night. Jeffrey was transmitting on 160m while listening to my signal on 473.00 kHz with his 160m inverted-L. 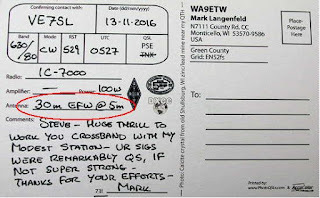 It's not really necessary to wait for another activity night to have some fun, so ... if you would be interested in trying a crossband CW contact, I would be more than excited to give it a shot. I can listen on 160, 80 or 40m for you, if you can listen on 630m for me! If we can arrange a sked, I could probably talk a few of the other local 630m VE7's into tagging-along so that you end up with a double or triple-header of VE7's in the logbook. 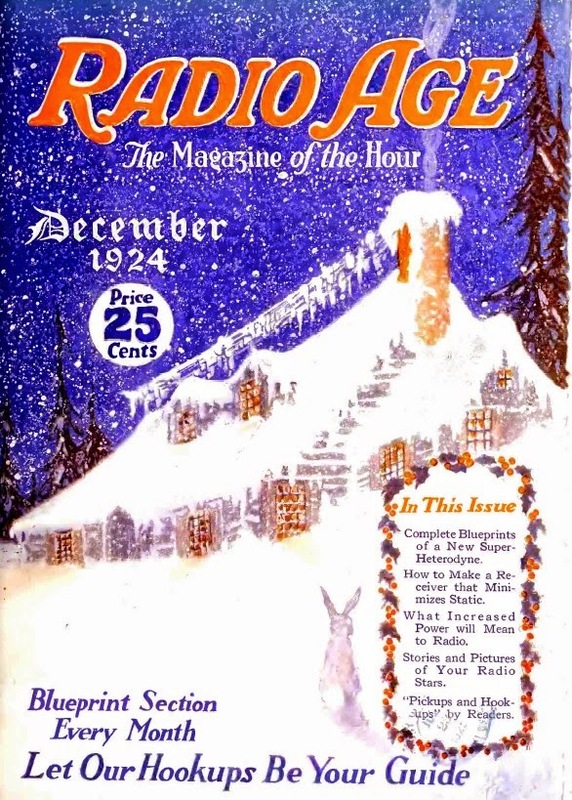 As the cold days of December dragged on, like most high school kids, I always looked forward to the arrival of the Christmas holidays ... even more so once I had discovered the magic of radio. 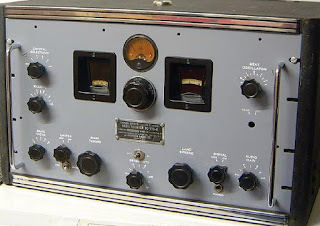 For me, it meant being able to stay up as late as I wanted, listening for shortwave and broadcast band DX on my big old GE cathedral-style radio. 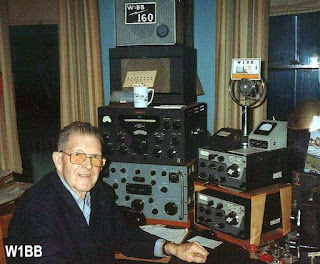 My radio shack was located high in a cozy attic bedroom, on the top level of our old three-story house in the middle of Vancouver. 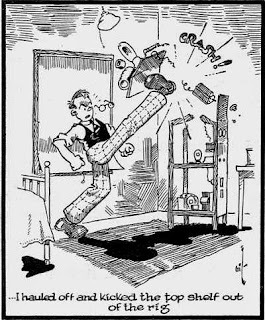 I can never recall having any kind of noise-related problem back then, in the pre-digital age. It seemed that even the power lines were quiet! One particular Christmas holiday stands out above many others ... December '64. By then, I was licenced and on-the-air as VE7ANP. I was using a Heathkit DX-20 (30 watts out) along with the Heathkit VF-1 VFO ... the one with the mesmerizing green dial (it was the sight of one of these dials a few years earlier that tweaked my interest in amateur radio ... but that's another story!). 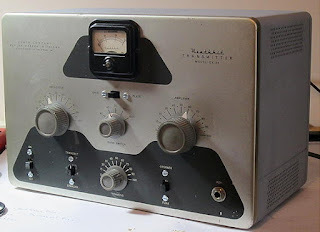 My receiver was an aging but lovely BC-779 Hammarlund Super-Pro. On the peaked porch roof just outside of my upstairs attic window, was the base of my new 40m antenna ... a full-sized 40m vertical groundplane. It was made from 33' of galvanized eavesdrop drain pipe, reinforced with an inner 2x2 and guyed in three places. The ground counterpoise system consisted of just three bell-wire radials, each a quarter-wavelength long ... one to the boulevard tree and the other two wrapped around the sides of the house, just under the eaves. The antenna was fed with about 10' of RG-58 coax. Switching was handled via a footswitch-controlled 'clunky' relay that also switched the VFO on for a better sounding note. 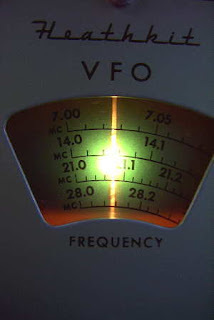 The highly affordable VF-1 was not known for its great stability but by finding just the 'right' 6AU6, and keeping the switch contacts clean, it could do a pretty good impression of a real VFO. This particular holiday stands out because I was intent on trying to work some JA stations on 40m, in the pre-dawn hours. 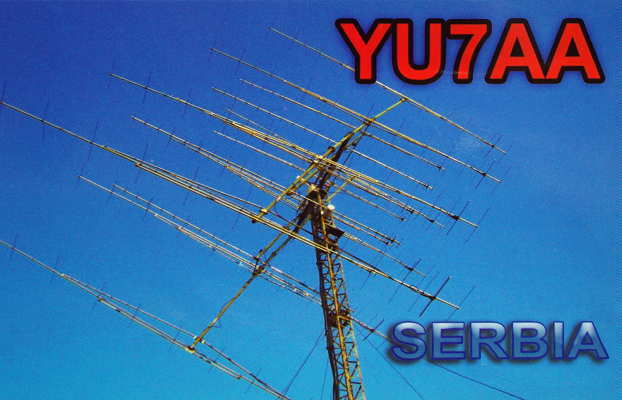 I had worked several JA's on 20m CW earlier in the fall but working Japan on 7mc with my previous low wire antennas had proven to be very challenging. 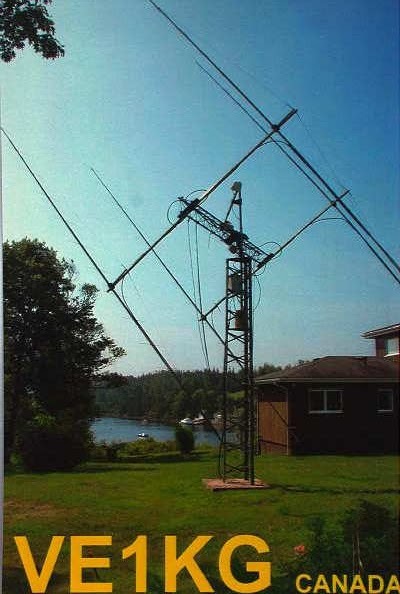 I hoped things would be different with my new 40m vertical. I recall rising the first morning of the holidays to find that we had received a huge overnight snowfall, about a foot in total. This seemed to happen a lot more often back then than it does now. 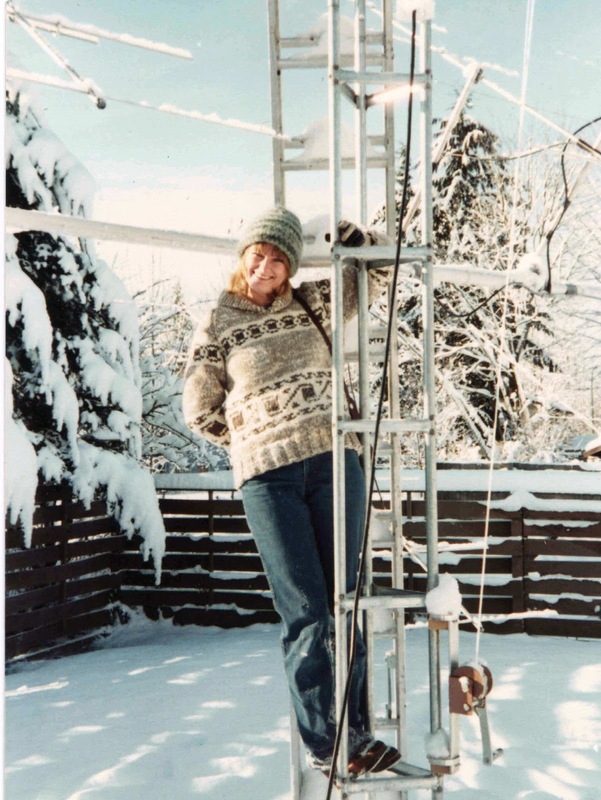 The peaked roof supporting the groundplane was piled high with fresh snow and completely covered the vertical's feedpoint and the radial wire junction. I pulled-up the wooden window's bottom sash and reached far enough out to clean all of the snow from the antenna's base while the rig, preparing itself for the impending assault of 40m's low end, warmed-up just beside me. A careful tune across the band brought a plethora of signals sounding as clean and crisp as the morning air ... it was the perfect 'DX-morning'! I managed to work several JA's that morning and throughout the Christmas break. Several of the contacts stretched well past my local sunrise, as 40m revealed some of her DX secrets to me for the first time. Like so many Christmases past, the memories of my Christmas '64 radio experiences are as vivid as if they had happened yesterday. I hope that your Christmas of 2016 is as joyous and memorable as well. VE7SL - my original 2m EME antenna. My recent round of 2m moonbounce activity reminded me of how much this mode has changed over the years. 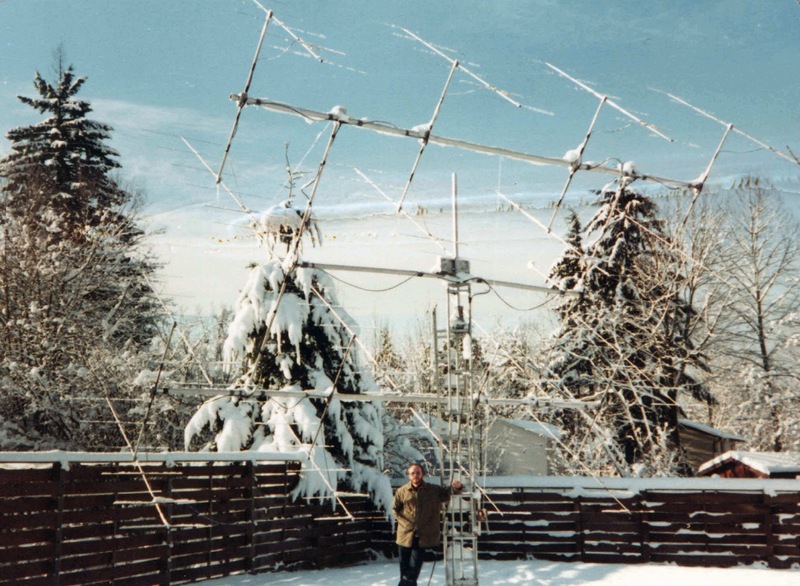 Back in the early 80's I decided that building a 2m eme system would be a good project for winter evenings and would keep me out of trouble for a few years. Back then, it was all CW, with a smattering of SSB reserved only for the big-boys. After a year and a half of evening work in my basement shop, my system was pretty much ready to go. 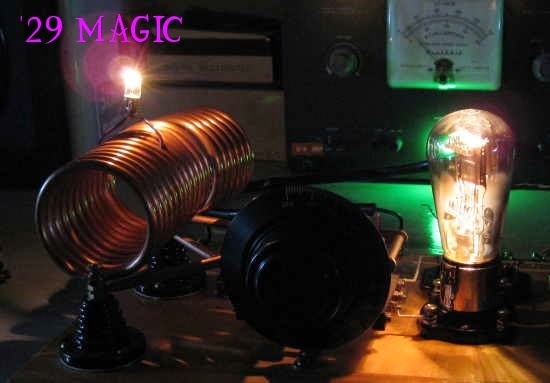 I built a kilowatt amplifier, from the ARRL's VHF Handbook, along with its plate and screen power supplies. 2m 'Plumbers Delight' handbook amp. The amplifier used a pair of 4CX250Rs ... a very popular tube to use then and readily available. The amplifier, when run in class-C, would put out nearly a kilowatt. All of the parts were reclaimed from surplus, purchased inexpensively at our local, long gone, 'Satellite Surplus' store on Vancouver's Main Street ... this was a goldmine of radio-only parts. Pete, the proprietor, was a real character. He had a good eye for a bargain and would buy government surplus lots of equipment and strip them for parts. He must have been well-connected as the place was full of gems ... but one dare not try and argue about prices! I saw more than one guy kicked-out for trying to work Pete down a few bucks. My antennas (see above), as well as the large H-frame support, were also built in the basement and used all scrap aluminum from one of the numerous scrap yards that were in Vancouver at the time. The system consisted of sixteen separate 6 element NBS-styled yagis, all phased. Many of the two-dozen plus N connectors were bought at Boeing Surplus near Seattle, another interesting source of parts, also now long gone. Keeping water out of the phasing lines and connectors was a real challenge here in the rain forest and if one connector was not done exactly right, would create a lot of headaches. The antenna took up a large portion of my small, 33'-wide suburban backyard. Pointing was all done by hand, using homemade scales to indicate elevation and azimuth angles, so that it could be pointed accurately even on cloud covered days and nights. A hand-cranked boat winch took care of elevation. I had a switch-box full of surplus VHF relays out at the antenna that protected my JFET preamp and also allowed me to compare sky and sun noise against a 50 ohm load. Over the course of a few years, the system was employed to work many Europeans as well as North American VEs' and Ws'. 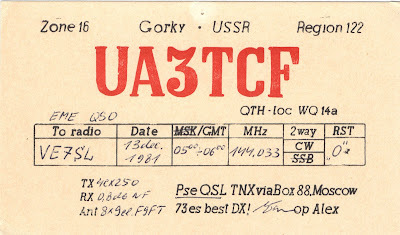 The one contact that stands out memorable for me, was with UA3TCF, east of Moscow. This was because I had to aim the array directly into my two-story house, located about 20' away! The moon was very low as well, so that not much elevation was required. I eventually found that trying to hold down a full-time high school teaching job and running sked requests at 0300 were not very compatible! It also became a lot of work just to maintain the system properly. I had met and completed my original goals and it became time to move on. Eventually the array was broken down into smaller sections and sold to local 2m guys, along with the amplifier ... but it was a huge learning experience for me and the fact that I survived building and playing with a 2,000 volt power supply, still scares the heck out of me! Plate & screen supply for the 2m amp. The VHF rack with xvrtrs and amps 50mHz-432mHz. My gal Sal adorning the 2m tower on a snowy Sunday morning. I couldn't hold out any longer! 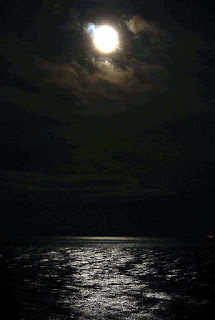 The sight of a full-moon rising over the ocean a few nights ago was just too difficult to resist ... I would have to spark-up my 2m mini moonbounce system and see what was happening. The QSLs are now all in from my last eme adventures in the early summer, bringing my total number of contacts to 80. My simple system uses a single 9el m2 yagi and an old third-hand 140W brick amplifier and built-in GaAsFET preamp. The yagi is mounted atop my 50' tower and fed with about 100' of RG-213 cable, along with its 2+ db of loss. Looking directly out over the saltwater of Georgia Strait seems to provide the near theoretical 'sea-gain' of 6db, making the little yagi behave more like a box of four in terms of gain. As well, there are no noise sources when pointing out over the water at the rising moon. Not being able to elevate the antenna means 'moonrises' only, and usually gives me about 90 minutes per session before the moon gets too high. 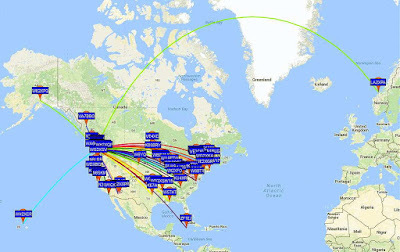 Last night was surprisingly active, mostly with U.S. stations, as it was still early evening here but there were also several early-rising Europeans on the band. 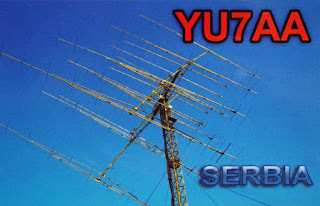 One outstanding signal was from a station I had not worked before, OK1DIG, who was running a 4 x 15 element yagi array. I called him a few times when his signal was easily audible (-15db) but he seemed to only hear me later, replying to one of my 'CQ's, with his signal starting to drop here. This is often the case on 2m eme as a reciprocal two-way path is not always the rule. 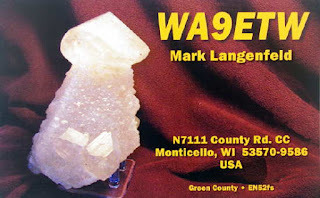 He was my only contact of the evening (#81) but also heard were K9SLQ, UT3MD, PA3FYC, all of whom I have yet to work. With another favorable moonrise tonight, albeit over an hour later, another go will be hard to resist! A few blogs back, I briefly touched upon my favorite contest of the year ... the 160m Stew Perry Contest, or more affectionately noted as the 'Stew' or 'SP'. 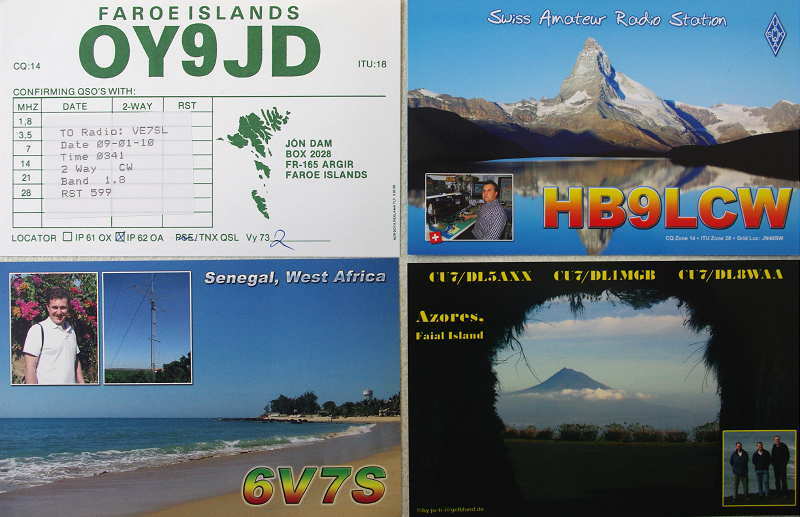 The contest is named in honor of W1BB, one of the earliest and most dedicated proponents of 160m in its earlier days, as well as being the first amateur to earn 160m DXCC #1, in 1976. Stew published a regular '160m News' bulletin, lovingly cranked out on his old Gestetner (remember those messy things? ), which was mailed free of charge upon request. 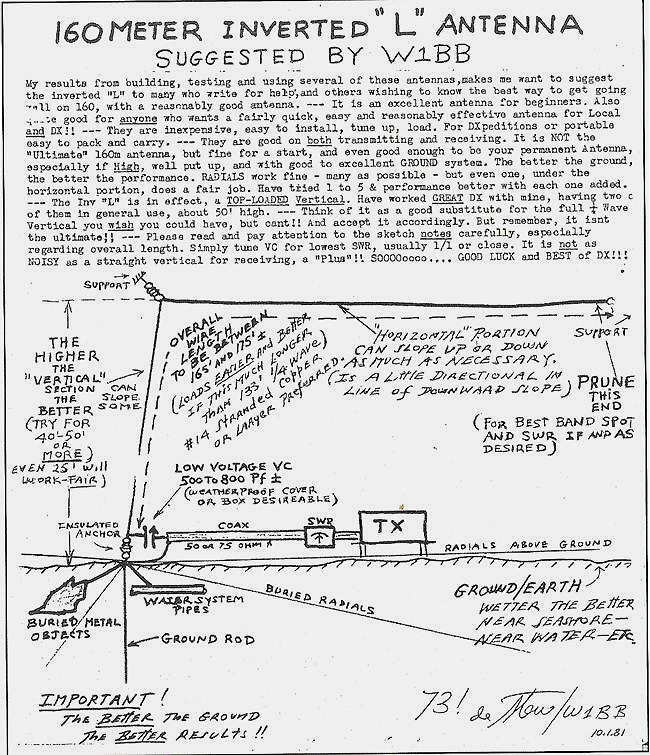 These bulletins were chalk-full of DX reports, station information, and antenna-building hints. It was hard not to get excited about the Topband after reading one of Stew's bulletins! This was largely back in the day when very few commercial transmitters had a 160m position on the bandswitch. If it did, it was most likely a hernia-making DX-100 or a similar E.F. Johnson biggy ... seems most 160m ops were he-men back in the early days. 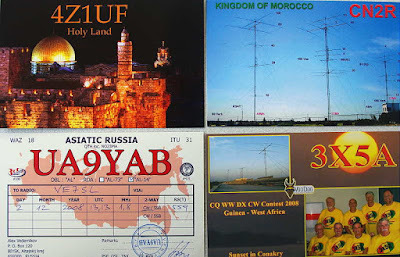 To make things even messier, the band was covered with horrendous Loran QRM, much more devastating then anything the Russian 'Woodpeckers' could throw at us ... working anyone on 160, let alone DXCC, was a challenge and probably the main reason why so many found the band fascinating. The 'Stew' is just a short 24 hour affair but often packs the CW band from end to end with a ton of activity, including lots of DX. It seems that most 160m diehards will jump at any opportunity to get on their favorite band, especially when conditions are as good as they have been of late. The 'SP' is somewhat unique in that its system of scoring is probably the fairest of any contest around. 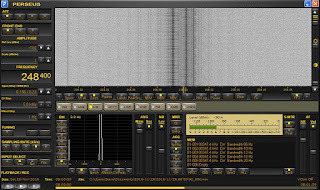 The number of points earned for any QSO is determined by the distance between the two stations, with your computer contesting software dutifully making the needed calculations automatically from the exchange of Grid Square information, rather than the ubiquitous '599'. Such a system gives stations in the western half of North America a chance to compete, on equal grounds, with the much higher activity levels found back east. With most contests awarding fixed points per QSO, it is much easier for eastern stations to rack-up big scores by working the multitude of other easterners ... this is just not possible out west where activity levels, and population densities, are so much smaller. 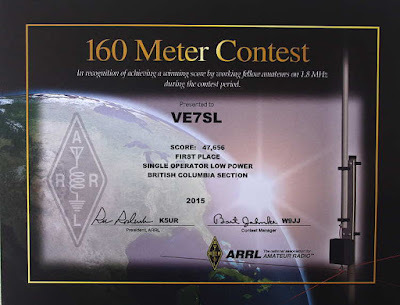 Contest PR-man ... Lew, W7EW, on behalf of the Boring (Oregon) Amateur Radio Club sponsorship, has sent a heads-up via the Topband reflector, which is reproduced below in case you wish to learn more. gas in the vehicle or to breathe. http://www.kkn.net/stew/ and see how they are different. stoking the fires of competition. VK6VZ VK6HD Memorial- Top Score by N. hemisphere station working S.
by any one of our species or just a tad obscene. 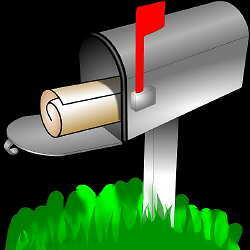 who haven't sent off their check or PayPals for their plaque sponsorship yet should not delay either. If you have a few hours of free time this Saturday night, why not give the 'Stew' a look, especially if you've never operated on the Topband. If you can load-up that old longwire on 160, I'll guarantee you'll have fun as well as be surprised at what you can work ... hopefully I'll see many of you this weekend in the best contest of the year! 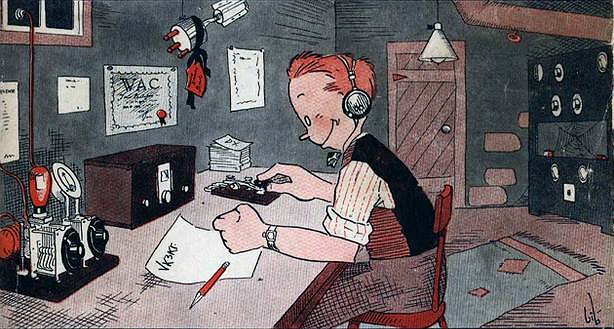 This Saturday as well as the next will be the annual Bruce Kelley 1929 QSO Party, otherwise known as the '1929 BK'. It's the once a year opportunity to celebrate the sounds of early amateur radio ... only transmitters that are 'era-appropriate' are allowed to be used. 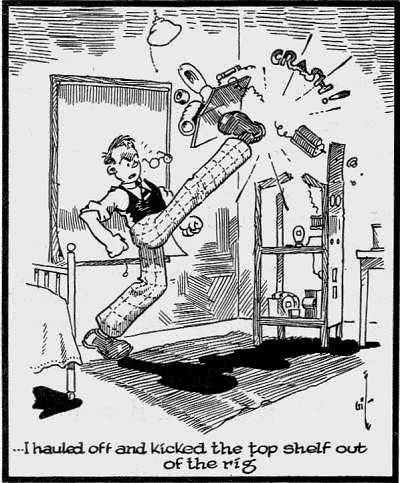 More specifically, transmitters must employ tubes that were available in 1929 or earlier, and transmitters must be self-excited. No crystals allowed! 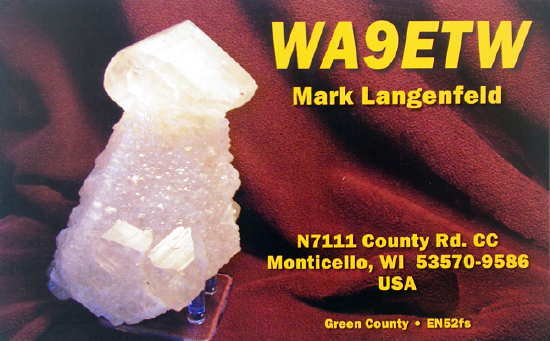 Crystals were new and largely unaffordable for most hams back in the depression days. Although the new rules did a lot to improve things when it came to 'signal purity', there was still a long way to go ... but the wheels of improvement had been officially set in motion and the next decade would see monumental changes in both transmitter and receiver architecture, as engineers along with some particularly gifted amateurs, strove to unlock the challenges of this relatively new technology. 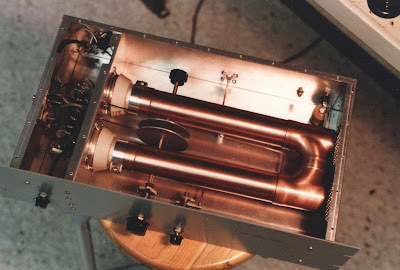 For the most part you will hear single tube Hartley, Colpitts or TNT oscillators with a few two-tube MOPAs' thrown in. Many of them will suffer the same problems encountered by the boys of '29 ... chirp, drift, buzzy notes and frequency instability from antennas swaying in the wind. The MOPAs' will sound much better but some surprisingly nice-sounding signals can be heard coming from properly tuned and optimised single-tube oscillators. I recall being blown away by the lovely sounding signal I heard from such a rig when first tuning into the BK activity several years ago, only to learn that it was a self-excited Hartley using 1/4" copper tubing for the oscillator tank circuit! The '29 watering-hole on 80m will be around 3550-3580 kilocycles (be careful not to confuse this with kilohertz!) while the early afternoon to sunset 40m activity will be found from 7100-7125 kc. There may even be a few on the very low end of 160m, later on the first Saturday night only. 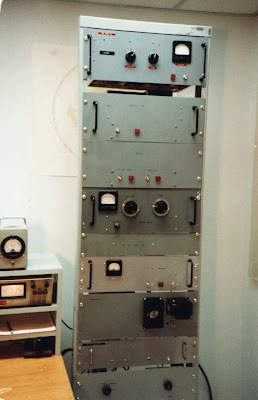 Although many of these transmitter styles were used on 20m and higher, BK rule-makers have wisely decided not to inflict these sounds on the present populace as it would likely keep the 'Official Observer' guys busy for several days writing pink-slips. Heck, there me even be time to throw something together for the following Saturday if you have a few parts and an older tube or two ... the '27 comes to mind and is readily found in many junk boxes. Maybe you know an old timer with 'lots of stuff' that could help out. Unfortunately due to a number of coinciding events, I'll not be on-the-air for the event this year, the first one I've missed since getting in on the fun several years ago. This weekend's ARRL 160m CW was a ton of fun. Conditions were unusually good, which always makes things more interesting. I ended up with 412 contacts in 78 out of 83 ARRL sections. If I was attempting a WAS on Topband, I would have made it to 48, missing just Nebraska and Rhode Island. Oddly enough, RI was my 50th state when I completed my original 160m WAS, back in 1984, which was certificate #225. That was done from my tiny 33' wide suburban lot, using the same antenna that I have now, a half-sloper. My radials were strung around all four edges of the property line and just lay on the ground or were stapled to the fenceposts. The power came from a pair of 6146's and was just a little less than I used in the contest this weekend as I entered in the Low Power (150W) category ... however, back then it took me several winters to finish my Topband WAS as there was a lot less activity than there is nowadays it seems. The only other sections missed during the contest were Puerto Rico, Newfoundland and North New York. With a fairly dormant Sun and the 'almost-quiet' geomagnetic conditions of late, good propagation continued into the week ... in fact, Sunday night was the best I have ever observed on 630m! Such stable conditions here on the west coast always favor the east-west and polar paths and Sunday proved that in spades. Overall, 53 different stations reported reception of my 630m signal, more than any previous overnight period. The highlight however, was the reception of my signal in Europe, with five decodes from LA2XPA on Kalvoya Island off the southwest coast of Norway. Rolf has an exceptional location and nice beverage antennas so most of the heavy-lifting was being done on his end. However, without the co-operation of the propagation gods, none of this would be possible. 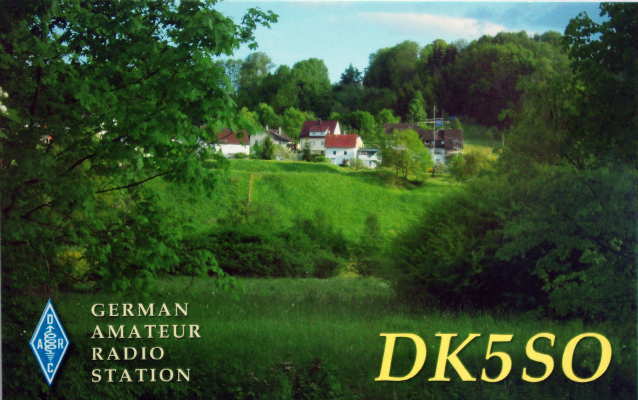 To make things even better, John, VE7BDQ, also made it across to Norway as his small station continues to perform amazingly well. As I mentioned in an e-mail earlier today, his is the textbook example of what can be done on 630m with a small suburban backyard, some homebrewing skills and a small antenna system. The WSPRnet map shown here illustrates just how many folks are tuning in every night to this part of the spectrum ... with many getting instantly hooked. Hopefully this great propagation is just a small taste of what lies ahead for us over the next several years of low solar activity. Recent mail has brought two nice surprises. 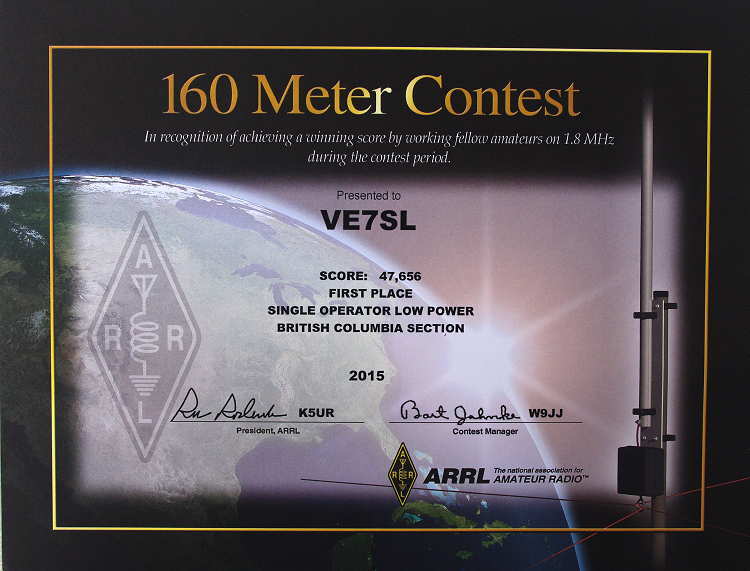 As I am preparing for this weekend's ARRL 160m CW affair, a certificate from the ARRL arrived ... from last year's 160m CW Contest! 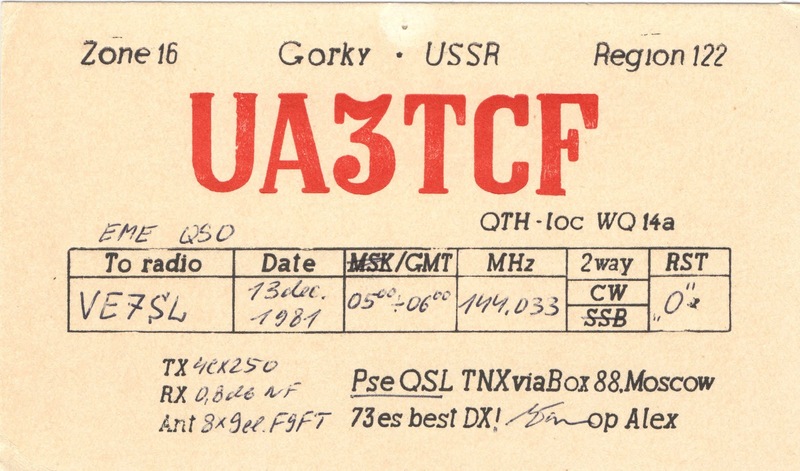 It seemed that I had somehow stumbled into top score from VE7 land for the single-op, low power division and since I haven't seen a QST in decades, this came as a complete surprise. Over the years I've always tried to test the 160m waters at contest time just in case conditions are amazingly good ... which they haven't particularly been for the past few years of solar angst. Even piddly Cycle 24, for most of its lifespan, has proven powerful enough to mess up the Topband. The 160 contest I enjoy the most is the December Stew Perry. It's the only one that's scored fairly and QSO points are determined by distance. Compared to working something close, any of the east coast grids from out west will get you a sack-load of points ... anything off continent earns you a boat-load. My strategy in the Stew has always been to 'search & pounce' the FN and FM grids for their high value point reward. If I had more late-night staying power in any of these affairs I could probably do a better job but I've found my fondness for the warm fleece-sheeted bed beckoning earlier each year. I'm sure it has nothing to do with getting older ... right? I honestly don't know how some guys, much older than myself, can hang in there 'til dawn. Maybe it's coffee, which would certainly do it for me. If I even look at a coffee after the noon hour, I'm still counting sheep past midnight. A late night contest-coffee for me would guarantee no sleep until the following night unfortunately. 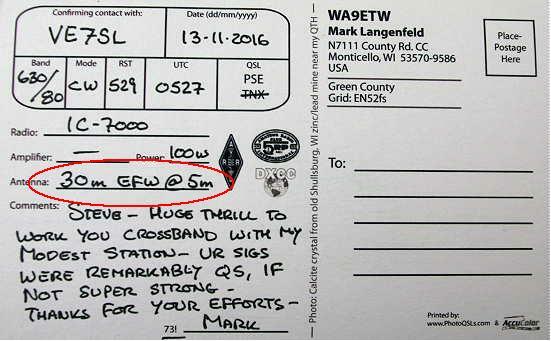 The second surprise was a nice QSL from Mark, WA9ETW in Wisconsin, confirming our recent crossband QSO ... 630m to 80m CW. Notice Mark's receiving antenna used on 630m, just a 100' wire about 15' off the ground! It doesn't take much to hear domestic signals on 630m so if you already have the WSPR software installed and are familiar with its operation, why not set your receiver to 474.200 in USB mode and see what you can hear. There are stations from coast to coast beaconing every night on this band. 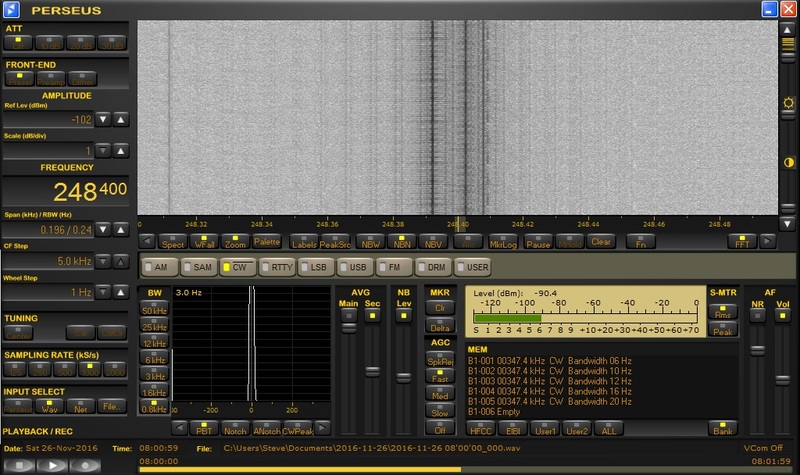 Be sure to set your software to upload your decodes to the WSPRnet site so that everyone, especially the beacon operators, can see who you are hearing. If we worked in the recent 630m crossband event and you'd like a card, please let me know ... I'll be happy to put one in the mail for you. How I do wish that the FCC would get on with it and legalize the 630m band in the U.S.A. Hopefully the turnovers in Washington will not translate into further delays as is often the case when big governmental changes are in the works. 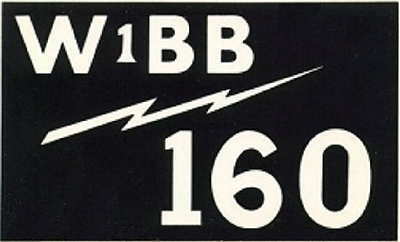 In the meantime, hopefully we can at least work each other in the ARRL CW 160 this weekend! As usual, the wonderful LF and MF conditions experienced during the week went into the dumper as the CLE weekend arrived. Looking back, most of this can be blamed on our monthly (~28 days) repetitive schedule which nicely matches the rotation of the Sun. It seems that the same large coronal hole stream that whacked us during CLE 212, is the same one that showed up for CLE 213 right on schedule. Perhaps we need to shift our schedule by a week in case it wants to hang around for yet another rotation. Conditions were not as bleak as I make them sound but they were a far cry from those enjoyed earlier in the week. The skip seemed fairly long on all three nights, but most signals were on the runty side, with only a few making strong appearances here on the left coast. As shown below, conditions were quite 'flat' for the entire weekend and propagation did not vary much in quality other than favoring slightly different regions each night. 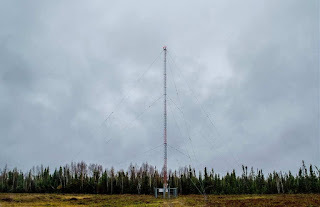 Interestingly, 'YLH - 247' in Landsdowne House, Ontario, whose antenna was pictured on my last blog, was not heard at all on both Friday or Saturday but had a booming signal on Sunday night. My usual procedure with the Perseus SDR is to record the CLE segments of the band for two minutes, every hour and every half-hour, from shortly after sunset to local sunrise. It then requires several hours of carefully going through the recordings to see what CLE signals were recorded ... sometimes spending up to an hour on one frequency only, sorting out what was coming through. I have also found that the classic blue-screen waterfall does not yield the best contrast for finding weak signals ... the 'photo-negative' screen shown above is far superior, with signals in black appearing on a white background. The logging at 0630Z of 'V7BE2' is a large drill ship, the "Deepwater Thalassa", located near the center of the Gulf of Mexico. This coming weekend will see another CLE challenge, this time in two ranges: 240.0 - 259.9 kHz plus 420.0 - 439.9 kHz. A 'CLE' is a 'Co-ordinated Listening Event', as NDB DXers around the world focus their listening time on one small slice of the NDB spectrum. A nice challenge in this one is to hear the Lansdowne House, Ontario, NDB, 'YLH' on 247 kHz. This one runs 250 watts and gets out well, having been logged from coast to coast. Listen for it on 247.417 kHz with your receiver in the CW mode. weekend. First timer logs too? Yes, please! Days: Friday 25 Nov. to Monday 28 Nov.
UNIDs that you come across there. the higher range not at all easy for most others. not in an attachment, with CLE213 at the start of its title. Tuesday so that you can check that your Final log has been found OK.
by 09:00 UTC on Wednesday 30th November. I hope to complete the combined results later on that day. http://www.ndblist.info/cle.htm Select the SEEKLIST link there. 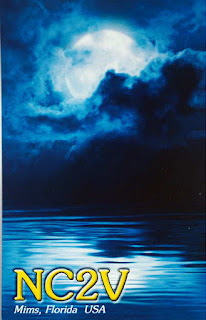 Upcoming Solar Years ... Can They Be Too Quiet? Most of us LF/MF and topband diehards have been looking forward to the next several years of low solar activity ... maybe even 'ultra-low' as some of the solar gurus are predicting. An interesting posting on the Topband reflector a few weeks ago by noted propagation expert, Carl, K9LA, made me re-think my expectations! About a week ago Wolf DF2PY posted a message here commenting on the recent adverse levels of geomagnetic field activity and how it will now change for the good - giving us good 160m propagation. the weakened solar magnetic field. solar minimum can be too deep for 160m. A good question to ask in the early 2020s will be "how was 160m?" So stay active on 160m and let's see what happens. My initial response was to think that perhaps there wouldn't be as much to look forward to as I had been hoping for, when it came to improved LF, MF and 160m propagation. 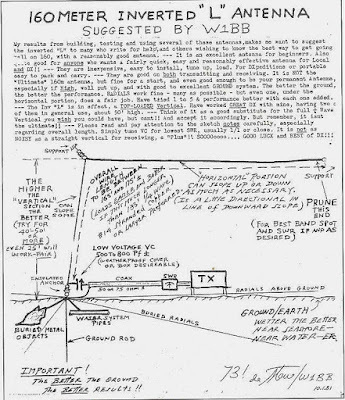 Carl's postulation was also backed-up by another mention on the Spaceweather site, although the influence of cosmic ray bombardment on radio propagation was not discussed. 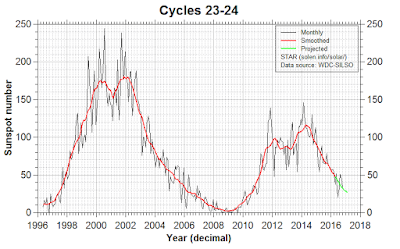 As I thought more about this unfortunate possibility actually coming to pass, I thought back to my own on-air and listening experiences during previous solar-low years ... particularly the unprecedented low between our most recent cycle and its predecessor, Cycle 23. The low period between these two cycles, as most will likely recall, saw the quietest solar conditions observed in the past 100 years. 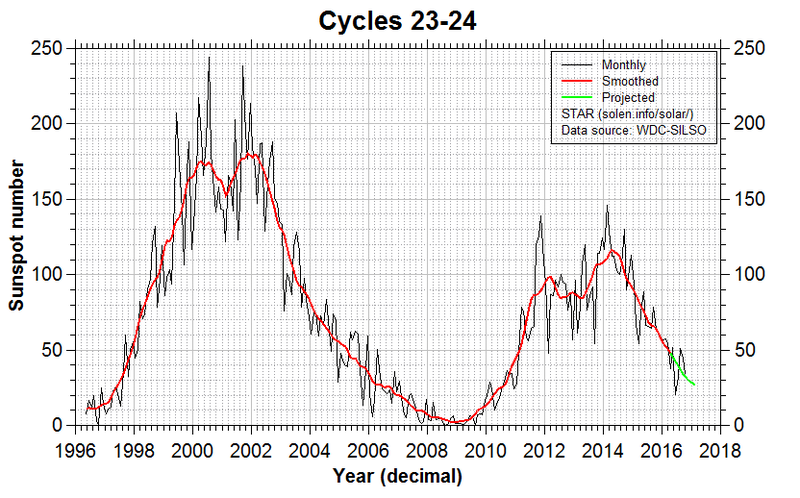 The solar-low winters saw week after week of a blank Sun, with solar activity virtually flatlining for the entire period. 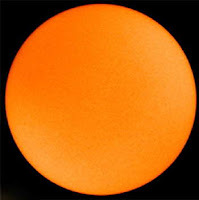 In 2008 there were 265 'zero sunspot' days and the following year saw another 262 days of blank suns! These effects were well noted here for two winters that are usually prime 'DX times' ... if ever there were a period when cosmic ray bombardment should negatively impact low frequency propagation, surely it would have been then. So just what did I observe? What I saw was not only what I had been expecting but was much much better than I had ever believed possible. 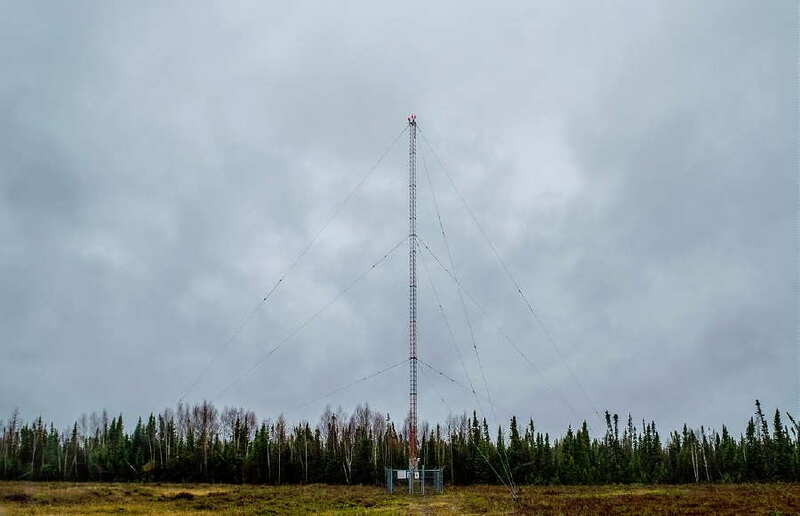 For west coast topband operators, the 'holy grail' of propagation is working Europe. Working Europe from here means that signals must travel through the polar regions, usually the kiss-of- death for weak signals, as the severe attenuation through the auroral zone means that it just doesn't happen very often ... except for this prolonged period of ultra lows. In a word, conditions to Europe were 'spectacular' ... night-after-night, for several weeks over a period of two winters, working Europe on 160 became normal. 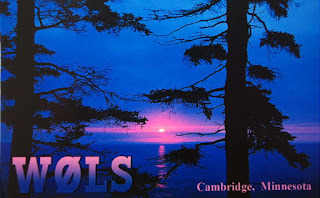 On most nights, European signals could be heard before local sunset, and on several occasions, CW contacts with Europeans, were completed up to one and a half hours before my local sunset. As darkness set in, more signals would appear and the band would rapidly become populated with Europeans ... and only Europeans. Most of the time there were no signals from North America evident, just Europeans ... a condition that had me shaking my head in disbelief night after night. It was something I had never observed before, as I watched 160m behaving more like 20m CW on a good day to Europe! 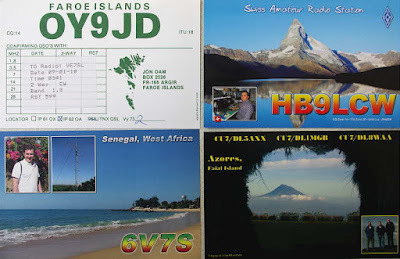 During this period, my DXCC totals skyrocketed from 99 to 143 worked, as new Europeans and Africans were added to my logbook. 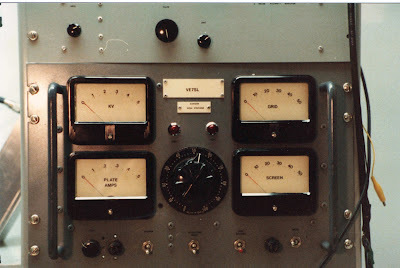 Signal levels were also outstanding, often pushing the FT-1000 S-meter well past the S9 level. 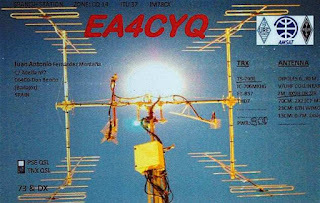 On one particular night, I recall hearing an SM4 calling CQ, with just such a signal. I set my output power level at 10 watts and gave him a call, to which he quickly responded. If cosmic ray bombardment was at a high level, it was not reeking any havoc as far as the west coast path to Europe was concerned! 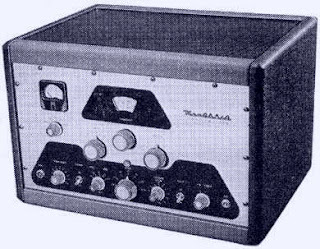 For the record, my topband system is nothing special, consisting of a simple 'half-sloper' over a poor ground and a very old amplifier running about 500W output. My other favorite winter pastime is chasing NDBs in the MF range between 200-500 kHz. Exceptional east west conditions were evident throughout the two winters of ultra-lows. 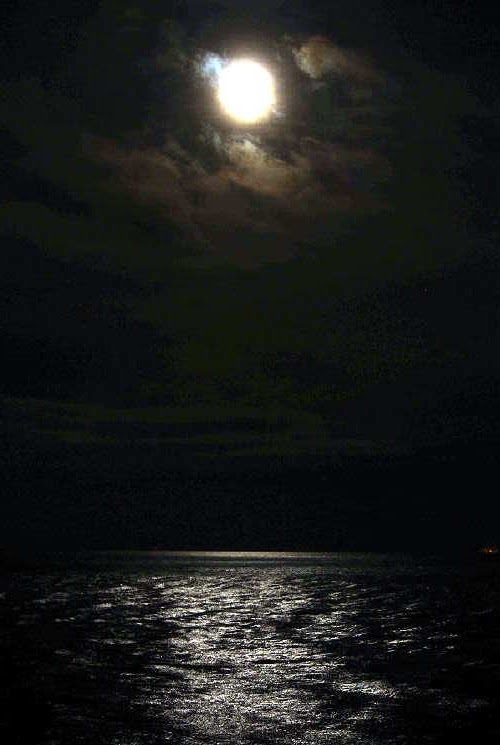 On one such night, I noted a new strong signal where none had been previously heard. Because of its strength, I surmised that it was probably a new NDB in nearby Washington state. Noting its ident ('NYA' on 414 kHz), I was not able to find any reference to such a beacon being previously reported and turned to the Yahoo ndblist group for help, posting my catch as 'unidentified'. Almost immediately I received a response, telling me that the signal I was hearing was located in Europe ... Svalbard to be exact, located midway between Norway and the North Pole! Now, European NDBs have never been heard from the west coast, other than occasional signals from some of Greenland's powerhouses, so this represents a very rare event. Although I have often listened for this signal, it has yet to be heard here again and my logging of remains its only reported foray into any part of North America. Unfortunately, in 2015, it was listed as 'decomissioned'. I have no doubts that this rare propagation was a result of the solar flatlining conditions of the time. As chilling as Carl's warning sounds, he himself admits uncertainty with a 'let's wait and see' attitude and after reviewing my own experiences under what surely must be similar conditions, I'm still very optimistic over what might be in store. Hopefully we shouldn't have to wait too much longer to find out!